Don’t let these sail away! 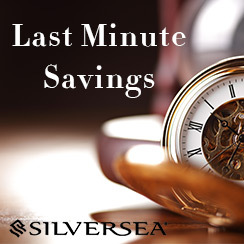 With our Last Minute Savings you can now get great value on a selection of worldwide voyages departing in the next few months. 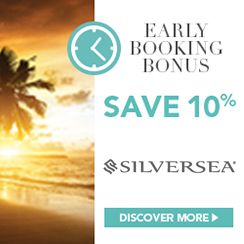 You will benefit from one-category suite upgrade AND an onboard credit of $1,000 per suite, which you can use for shore excursions, spa treatments, specialty restaurants and more when you book before 30th April 2019*. *If the one-category upgrade is not available, guests receive instead $500 onboard credit per suite for a total of $1,500 onboard credit per suite. Terms and conditions apply – see the Campaign Terms for full details. Whether you dream of a luxurious voyage with lavish surroundings or a thrilling expedition to the most remote places on the planet, take time now to plan ahead and save 10% on selected cruises. With voyages sailing to over 900 immersive destinations on all seven continents, the choices are remarkable and the savings are, too. Especially with everything else Silverseas fares include, from ocean-view suites, wines and spirits throughout the ship to free WiFi, included gratuities, a butler for every suite and more. *Excluding All Full World Cruise. Terms and conditions apply – see the Campaign Terms for full details. Their 8 small luxury ships can show you the world in a far more personal, meaningful way. They can glide into small, secluded harbours not yet on the radar screen. Or transport you on an expedition to some of the most remote regions of the globe. Then return at night to the gracious hospitality that reflects their Italian heritage. The lavish amenities of your private sanctuary at sea. And the relaxed, friendly camaraderie in the lounges and open bars where faces quickly become familiar and conversation strikes a common chord. Silversea voyages and cruise expeditions sail to over 800 destinations on all seven continents, more than any other cruise line — large or small. Their itineraries include many ports with late-night and overnight departures providing you with more time to experience the local colours and cultures. For those who want to explore beyond the shore, an extensive collection of land adventures offer a convenient, seamless way to extend your travels. Silversea’s suites offer one of the highest space-per-guest ratios of any luxury cruise accommodations. All of their suites feature ocean views, and many with a private teak veranda. That’s why every Silversea suite is indulgently spacious, and beautifully furnished. Freshen up in your Italian marble bathroom with a choice of luxury amenities to suit your personal taste.